Kenya’s Harambee Stars will play a friendly match against South Africa’s national team Bafana Bafana on Tuesday, 16 October at the Nyayo National Satdium. The match which is already listed by FIFA was confirmed on Thursday by Football Kenya Federation (FKF) and South Africa Football Association (SAFA). 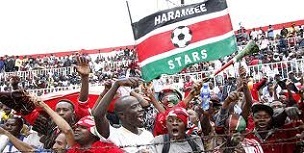 According to organizers, the big clash will be played in the evening under floodlights to ensure more Kenyan fans get the opportunity to watch the match, since Tuesday is a weekday. This will be a big test for the new head coach Henri Michel who was caused controversy after saying that the regional tournament, CECAFA wasn’t top of his priority and he was focused on the upcoming 2013 Africa Nations Championships (CHAN) qualifiers. Bafana Bafana will play Poland in another international friendly slated for 10th October in the Polish Capital, Warsaw. The team will then leave Warsaw on October 13th for Nairobi to prepare for the match.